I’ve been playing around with different freezer fudge recipes lately. 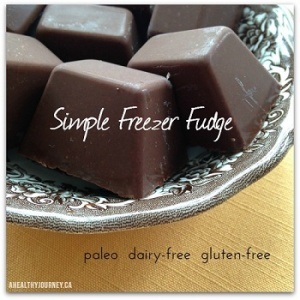 Freezer fudge is so easy to make with ingredients that are already in your pantry. 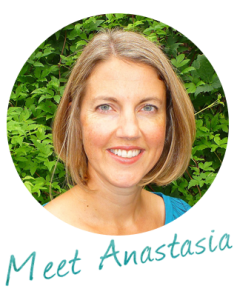 You can keep the fudge simple or experiment with different spice combinations and super foods. These bite size morsels are packed with healthy fat that will give you sustained energy. Most of the recipes I found call for a lot of honey or maple syrup which are still sugar. I believe treats shouldn’t leave you feeling wired or spaced out. The less sugar I eat the better I feel. I wanted to see if I could get the sugar down and still keep the fudge slightly sweet but with a creamy chocolate texture. 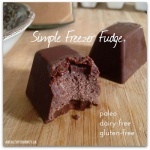 The best recipe I found on-line was by Mary Shenouda over at Paleochef.com. I love how she combines tahini (sesame seed butter) and ghee (clarified butter) together with almost no sugar. She calls it “Phat fudge”, and it is a little bitter but an excellent option because it’s super low in sugar. My version is a touch sweeter and uses sunflower seed butter with coconut oil. You could totally have fun with this recipe and try using different nut or seed butters and play around with spices and super foods. Ghee does give the fudge an amazing buttery flavour but if you want to go totally dairy-free, coconut oil is pretty tasty too. One of the most important ingredients is the cacao powder. Try to find the highest quality available in your area. I’ve been buying raw organic Peruvian Cacao Powder from The Light Cellar in Calgary. High quality cacao powder contains antioxidants, magnesium, iron and zinc. It tastes amazing! Warning: Making freezer fudge is super addictive because it’s so easy, quick and tastes amazing. What’s your favourite bite-size treat? How do you stop yourself from eating more than 1 or 2 pieces? Place the coconut oil, sunflower seed butter and honey in a small pot on low and stir until well combined. Whisk in the cacao powder and the spices until smooth. Spoon the mixture into an ice cube and put them in the freezer for about 20 minutes to harden. Store the fudge in the freezer. I like to pop all the cubes into a freezer bag so they stay fresher. mmmm— i love coconut oil! this looks like a great recipe. Can’t wait to try it. Let me know how they turn out, Lauren! where do you buy those ingredients? Only the maca powder is a specialty item that is available from specific stores such as the Light Cellar. Otherwise everything else I can get from normal grocery stores. I usually get them from the organic section of Superstore. I want to try this! Can I substitute vanilla with vanilla extract? If I can, how much should I put in? You could leave it out or try adding 1/2 teaspoon of vanilla extract. I haven’t tried it but it should be work.